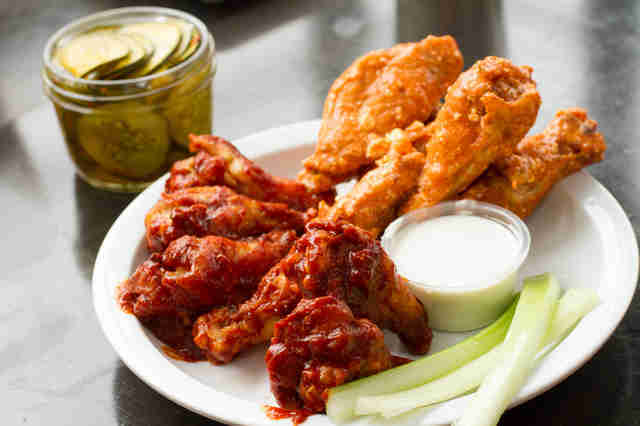 Just because Los Angeles isn’t called Buffalos Angeles doesn’t mean you can’t find great wings here -- you just need to know where to look. 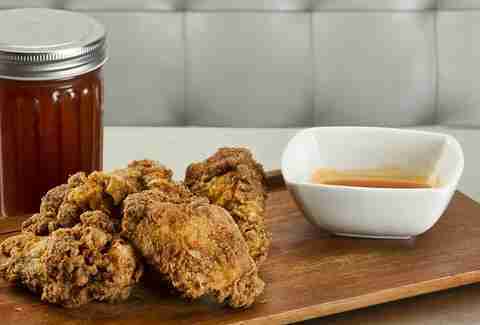 Which is why you should dip into this list of the best wings in LA (and some blue cheese or ranch, natch). 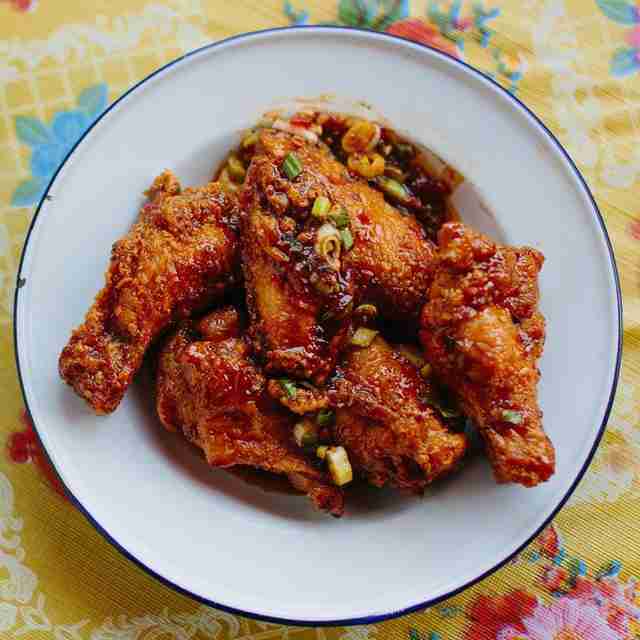 Sang Yoon's Asian-fusion restaurant doesn't call 'em wings (they're chicken lollipops), but don't be mistaken: they are crispy-fried, savory poultry, and you will want more as soon as you're done with your first order. 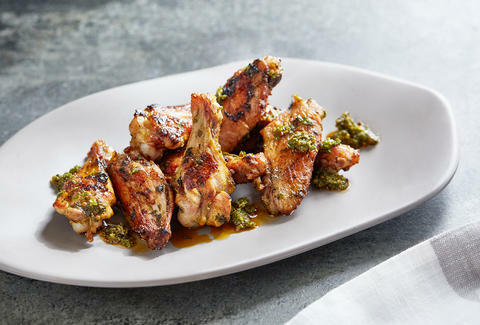 These fall-off-the-bone wings have gained a cult following thanks to a vinegar-based hot sauce that's basically served at the bottom of the order, so eating them's a bit more DIY than usual: dip, spin, eat, repeat. This little Arts District hole-in-the-wall (in all honesty, it’s just a window out into the road) is only a little over a year old, and they have been absolutely slaying the fried chicken game. There are not nearly enough great soul food spots in LA which sweetens up their $10 dinner special -- a plate of their insanely tasty and expertly battered fried chicken wings with sides of mac, greens, and cornbread. If you’re thinking this it’s yet another one of the establishments of the same-named spots in Silver Lake and Fairfax, think again: this is a completely different Charcoal, helmed by two-Michelin star chef Josiah Citrin, whose smoky grilled chicken wings with oregano, chili, and vinegar are perfectly finger-lickable, perfectly spicy, and well, just perfectly perfect. The chef at this ultra-colorful Silver Lake Thai restaurant was named a Best New Chef by those fancy people at Food & Wine earlier this year, and though they name-checked one of his pork dishes in the magazine, it’d be a safe bet that his wings actually won them over and they were just embarrassed that they’re so good: they’re sweet, and salty, and sticky, and juicy, and OMG THEY’RE ALREADY GONE LET’S GET ANOTHER ORDER. 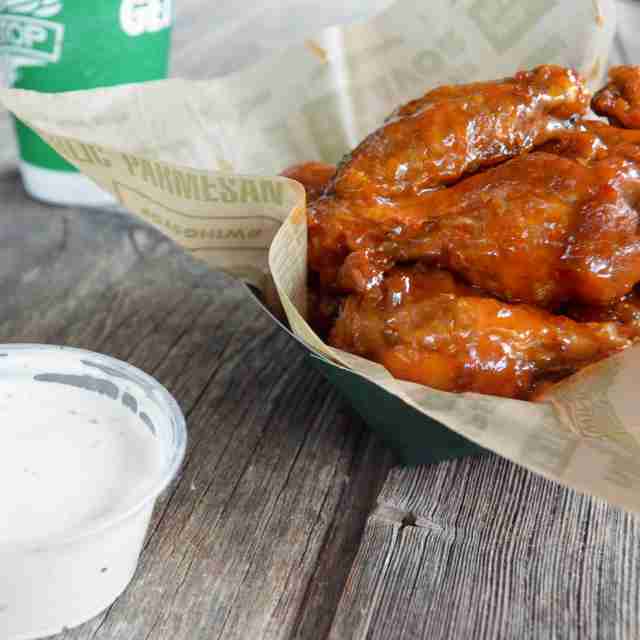 Look, if nobody else is gonna say it, we are: Wingstop is amazing. Stop confusing it with that dastardly Pizza Hut creation WingStreet, and just think about all these options -- every one of which is seemingly perfectly crispy-cooked and juicy and excellent: Original, Atomic, Mango Habanero, Cajun, Louisiana Rub, Hickory Smoked BBQ, Smoke9 (like a mesquite dry rub), Lemon Pepper, Garlic Parmesan, Hawaiian, or Teriyaki. OPTIONS, BOYS AND GIRLS! Anybody who’s had Pok Pok in Portland or New York knows how lucky we are that they made their way down to us. 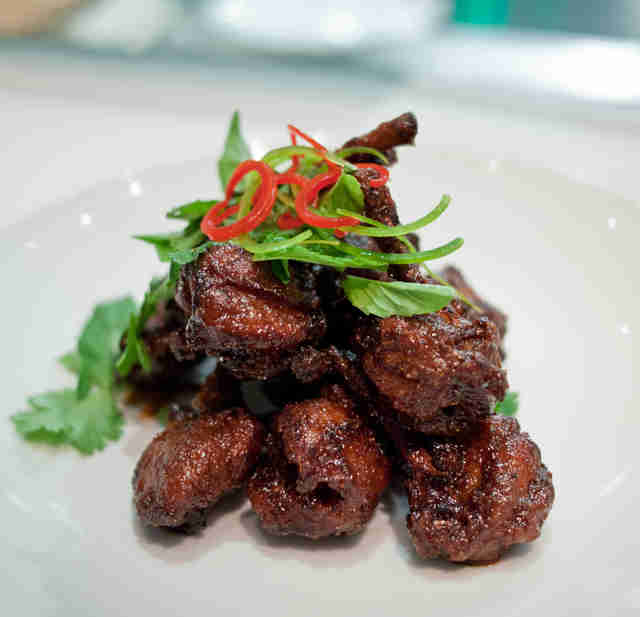 You’ll quickly be a Pok Pok believer when you bite into their Vietnamese fish sauce wings (get ‘em spicy), marinated in house fish sauce, sugar, fried, and then tossed with caramelized Phu Quoc fish sauce and garlic. It’s virtually impossible to order something bad at this bar arcade, whose food comes from the lauded Starry Kitchen team, but you’ll regret not getting either the Double-Fried Tamarind wings (with tamarind, garlic, and black pepper) or the Double-Fried Ginger wings (with gochujang/Korean pepper paste, rice vinegar, honey, and lemon). And after wings? Burgertime. Like, both literally, and you should get their burger, too. 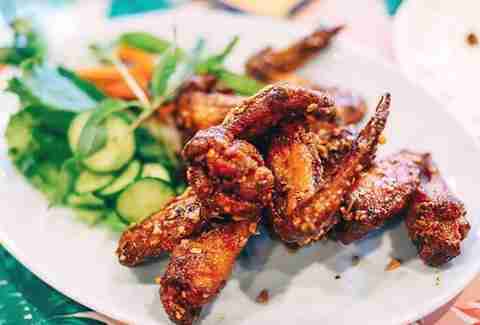 The small-but-power-packed Jidori chicken wings at this gastropubby K-town beer hall are a menu highlight (also a menu highlight: everything on the menu); the pro tip is to go for the Volcano Chipotle, and wash it down with anything IPA. Good luck. This flapper-centric dive's got four locations (Melrose, Glendale, Pasadena, and, um, Valencia? 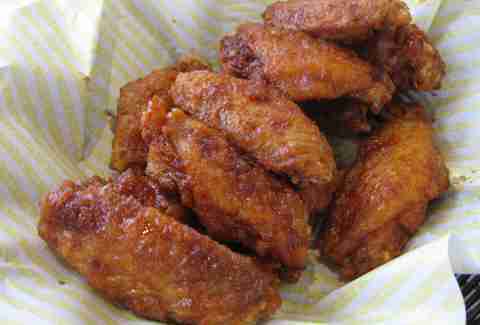 ), with wings in mostly standard varieties (save the zesty lemon-pepper), and -- bonus! -- crazy-good Philly cheesesteaks. The Lime Truck got its own brick and mortar four years ago, and they’ve been serving up next-level wings since then. 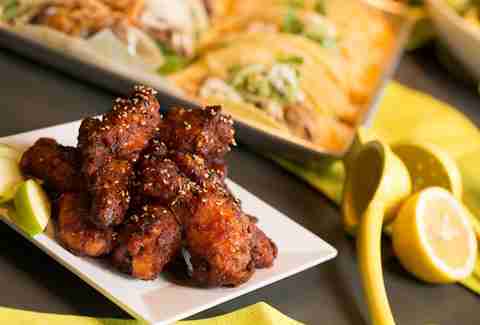 The Spicy Sambal Wings are battered with spicy-lime-sambal sauce & sesame seeds, and their Chimmi Wings with chimichurri and chipotle-honey aioli (both garnished with green apple and lime), and both will ensure you forget hot wings for, like, at least as long as you’re eating them. This Korean mini-chain makes mind-blowing wings: crisp-skinned numbers in honey, hot, or soy-garlic sauce, the latter of which you'll be tasting for days, though that's kind of not a bad thing. The phrase "no frills" was invented for this standby cafe, which is all about serving up hot and BBQ wings the way tourists/transplants remember them from the East Coast (garlic parmesan is available for fancy-pants Angelenos/tourists and transplants pretending to be fancy-pants Angelenos). Bonus: you can get wings or drums only for just a buck-or-so-more. Wilder Shaw is a regular Thrillist contributor who has dreamed about wings more than once. Ask him which Button Mash wings he likes better on Twitter at @WilderShaw_ and Instagram at @wildershaw. Jeff Miller is Thrillist's Senior City Editor for Los Angeles, and grew up in San Fernando Valley learning the ins and outs of negotiating traffic all over Los Angeles (Orange FTW!). When he's not eating delicious food/drinking delicious drinks/doing ridiculous things he's the band leader of Black Crystal Wolf Kids, the world's first indie-rock tribute band; you can also see his byline in publications like The Hollywood Reporter, Billboard, and Relix.